These architectural building blocks are fundamental design tools that enable endless expression of your lighting ideas to meet specific customer requirements. Novato Lines + Arcs deliver illumination tailored to fit each unique space. Whether a simple luminous line is needed or a complex pattern combining luminous angles and sweeping curves, this lighting provides limitless possibilities. Power drop kit required for each continuous run of fixtures; see catalog CPS12153 to order. These fully-enclosed three-sided luminous forms brighten horizontal and vertical planes. They provide functional lighting with comfortable luminance levels. Strong lines yield a distinctive visual presence. The luminaires are ideal for separating open offices, providing wayfinding, or adding markings. Mix and match with the entire Novato family. Integral power supplies simplify electrical requirements, meaning most runs will need a single power drop. Moreover, Novato Lines + Arcs are designed to minimize hanging hardware, delivering an exceptionally clean ceiling plane. Powerful magnetic connections make connecting fixtures a snap, while easy daisy chain wiring expedites installation. Position the power drop at a mounting point or anywhere along the run. Integral power supplies are located in the channel that runs on top of Novato Lines + Arcs. 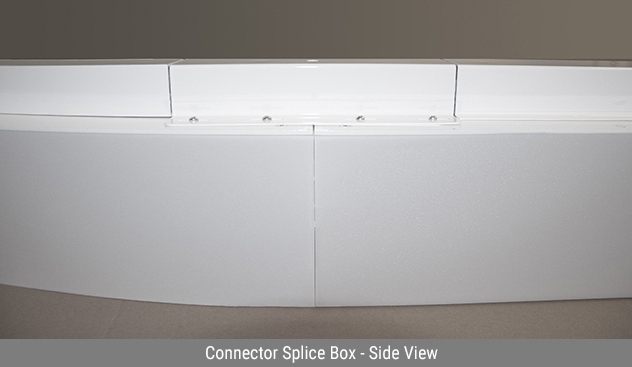 When designing runs, connector splice boxes are provided to ensure smooth, continuous transitions between fixtures, as shown below. Plus, these enclosures conceal wiring and provide a secure mechanical connection that locks luminaires together.